The slogan on the sign reads: "Modern Version of Ganymede" Introduction of Budweiser Beer to the Gods. 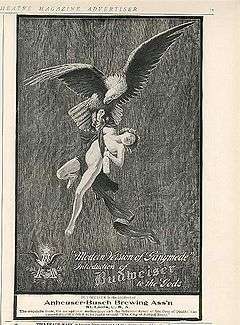 [note 1] ---- The original Anheuser-Busch ad as it appeared in the February 1906 issue of Theatre Magazine. According to the 1913 Webster's Dictionary, a slogan (/ˈsloʊɡən/) derives from the Gaelic "sluagh-ghairm" (an army cry). It has come to mean in its contemporary sense, a distinctive advertising motto, or advertising phrase, used by any entity to convey a purpose or ideal; Or, a catchphrase. Taglines, tag lines, or tags are American terms for brief public communication promoting products and services. In the UK they are called end lines, endlines, or straplines. In Japan, they are called catchcopy (キャッチコピー, kyachi kopī) or catch phrase (キャッチフレーズ, kyachi furēzu). ↑ Sean Brierley (2002). The advertising handbook. Routledge. ISBN 0-415-24391-2. 1 2 3 4 5 "Slogans As A Means Of Social Control". By Frederick E. Lumley. Papers and Proceedings of the American Sociological Society, Volume 16, 1921. p. 121–134. ↑ "The Art and Science of the Advertising Slogan". Adslogans.co.uk. Archived from the original on 24 April 2011. Retrieved 2011-03-28.